Thanks to the strong 2.5 HP motor, you can reach speeds from 0.8 to 20 kilometres per hour. The big running surface can be lifted up to an incline of 15%. The wide range of trainng is suitable for all users, from beginners to professionals. Thanks to its stable workmanship and the valuable components, it is suitable for users up to a maximum weight of 170 kg. The new console is revised and offers with its LED display all important training data - clearly readable and at a glance. It offers 20 running programmes, which are well suitable for beginners as well as for pros. The classic programmes like distance target, steps or calories targets are suitable for beginners. Advanced or regular users can find a challenge with the eight HIIT training programmes (High-Intensity-Interval-Training). Doing those, you can actively strengthen you health and train physically in short but very intensive training sessions. Using the Media Player, you can interactively run on virtual route profiles all over the world. Either alone, with friends or against other users all over the world - using the Media Player, you can always get new training stimulations or compete against others. Via the Media Player and a television, the image data are displayed. Depending upon the topography of the route, the incline changes automatically and gives a direct feedback. Even the increasing or reducing running speed is directly displayed on the screen - a direct motivation aid for training partners or in a competition. 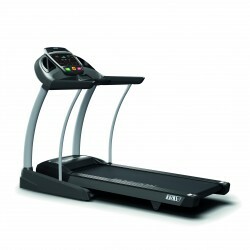 Horizon treadmill Elite T5.1 Viewfit add to comparison list.